Fashion and sportswear brand Lacoste has opened its largest flagship store in the world on Brompton Road, Knightsbridge, London following a £1.4m re-fit. 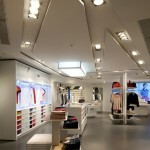 We installed LED illuminated ceilings in the changing rooms and 3d LED light boxes to main main store area. Lacoste also appreciated our capability to create prototypes to test new ideas before incurring the costs of manufacture. In order to meet the opening date deadlines, we condensed re-fit, which involved works that under normal circumstances would take a period of 14 weeks, into Lacoste’s 10 week timescale by working a two shift 24 hour work pattern and maintained very tight project management controls. The fit-out of this new three storey 6,500 sq ft flagship store, which used to be French Connection, also involved a feature staircase and installation of new lifts. The new store is the only space in the UK to house Lacoste’s new concept, Lacoste ‘Lab’ and the new contemporary L!VE collection. The store also includes footwear, childrenswear, leather goods, eyewear, watches and the exclusive first launch of its home textiles range. Launched by Lacoste’s Design Director, Christophe Pillet the Lacoste ‘Lab’ has created an innovative line including a bike, surfboard, skis, football and rugby ball through a series of collaborations. These effects involved the design and manufacture of some very intricate joinery and cabinet displays. This included a “heritage wall” on the ground floor, which showcases the multifaceted world of Lacoste and features images documenting the brand history and the spirit of founder, René Lacoste. Another concept within the store is the ‘Polo Fit’ wall and ‘Polo Bar’, where the brand’s iconic L.12.12. polo shirt is exhibited in all 65 colours. The official opening featured live DJ sets, live music and was attended by many “A” list musicians, fashion designers, models, actors and sporting professionals such as Will.I.Am, Eliza Doolittle, Will Poulter, Filipe Oliveira Baptista and David Ginola.